Some birds are absolute masters of the air ... we can refer to them as "active aerialists". One of those species is the Tree Swallow (Tachycineta bicolor) ... a common spring and summer resident throughout the North Coast. As a matter of fact, they nest throughout the United States and Canada, as far north as upper Alaska and the Northwest Territory. 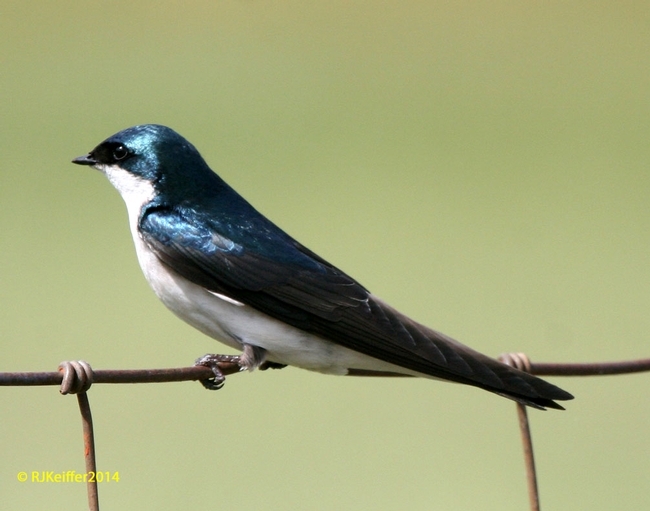 Tree Swallows nest farther north than any other American swallow species. Tree swallows are, according to Cornell Lab of Ornithology, one of the best-studied bird species, however, little is known about their lives during migration and winter. Most of these birds winter in Mexico and Central America. The species' latin name Tachycineta bicolor is derived from the Greek words "tachys" meaning fast and "kineo" meaning move, and the term bicolor which refers to the two-toned coloration of the bird ... iridescent blue on the dorsal side, and bright white on the ventral side. Being cavity nesters, this bird will often utilize artificial nest boxes. At the UC Hopland Research & Extension Center they can be found on the Sanel Valley floor and near water bodies at upper elevations ... but they are not common in most upper elevation habitats UNLESS it is near water. This photo shows a handsome male near a nestbox at HREC.